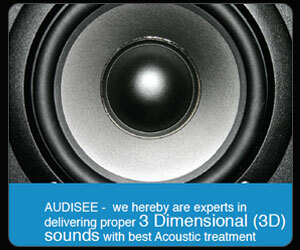 Every seat in the home theater is a good seat when it comes to Audisee Acoustics - All seats will enjoy the same sound. That's an Audisee Promise. A technique that delivers the full spectrum of sound from the loudest explosion to the softest whisper. These sounds are delivered from the speakers to the viewers ear at the precise moment. Nothing escapes the system here whether it is the gentle flapping of a bird's wings, or the rustle of leaves on a dry patch of land. Tonal balance is the balance in sound during the movie experience, sometimes the dialogues in a movie might be sharp or blunt due to an imbalance in the tone. Timbre matching gives you the right perspective of the sound during the movie experience, sometimes a shotgun might sound like a rifle due to mismatch in the timbre. These are caused by the lack of technology and /or because of acoustical influence of the environment. The wrong kind of bass emanating from the system can trigger a headache or hasten the hands towards the ears. Bass from the subs and speakers are clearer, tight and fast resulting in "no more headaches because of muddy and booming bass"
Do you know that your room light (ambient light) determines what type of display will be appropriate for the room. Black & White levels and color saturation of the picture is because of the type of display used be it Plasma, LED, LCD or a projector in-relation to the room light makes or breaks picture quality. It is common in almost all flat panel displays that the picture seen is stretched, where a narrow shouldered man has wide macho shoulders and even sometime one-third of the image is chopped or missing. This is all because of the aspect ratios being wrong. In some cases pictures viewed in projectors or flat panels have many Artifacts introduced in to them which are not intended to be a part of the movie. The best example of this is when improper black levels add information that the director did not intend to show. All "emissive" devices like CRT, Plasma panel, LED, Light bulb (projectors) or LCD have a half life time, when calibrated these panels will perform better and last longer. Audisee's magic eyes will ensure that your display and audio will come together as a seamless whole, the perfect home cinema experience. 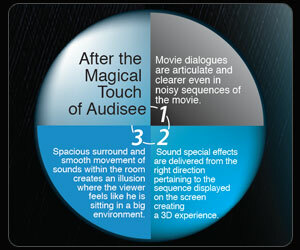 At Audisee our main objective is to make the viewers GET INTO THE MOVIE. We define 'Getting into the movie' as the science of creating the prefect home cinema. This is where one does not just merely watch a movie but feels all the hidden effects in the audio and visual contents of the movie. 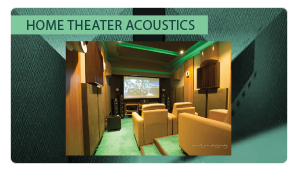 To give our clients the best movie experience in the comfort of their homes, Audisee is striving to bring in new technologies into the market and learning new concepts and solutions in the field of Acoustics and Visual entertainment. The magic touch of Audisee can transform an ordinary movie experience at home into an extraordinary experience of the senses. Hence when the environment is treated Acoustically, Sounds and Visuals are calibrated perfectly, you will not just watch a movie; you will "Feel the Movie." 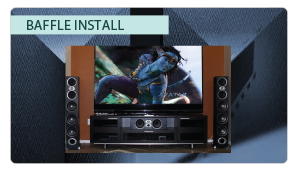 Backed by a team with more than 15 years of experience in the field of acoustic and digital technology, Audisee knows just how to make your home theater perform at its best. 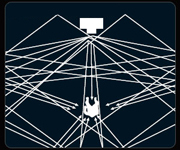 They mask the formation of Phantom Images (sounds created between speakers). They introduce complications like flutter echoes, standing waves and comb content (Timbre) and quality of the sound. Some long reflections are encouraged to maintain life in the sound while short reflected sounds are discourages as they deteriorate sound quality. 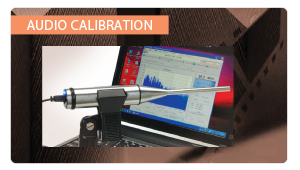 A certified ISF (Imaging Science Foundation) professional specializes in calibrating both the visual aspects of home theaters.